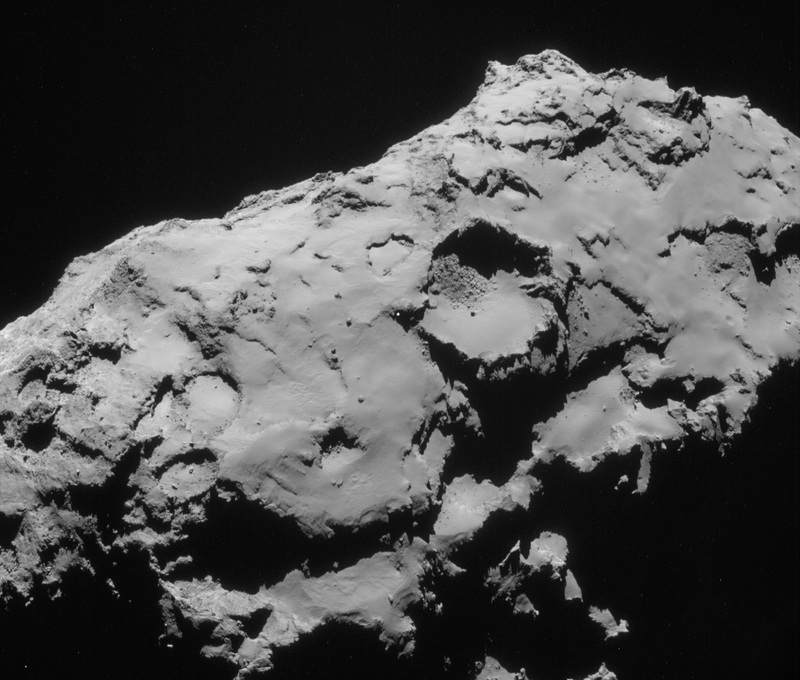 The European Space Agency (ESA) has announced that its Rosetta spacecraft will deploy the Philae lander on 12 November. The chosen landing site will be finally confirmed on 14 October. If everything goes according to plan, Philae will touch down on the surface of comet 67P/Churyumov-Gerasimenko in the late afternoon (for Europe) of Wednesday 12 November.Site J, the landing site on the ‘head’ of the comet’s nucleus chosen unanimously mid-September by the mission’s scientists and engineers, remains the primary site and Site C on the comet’s ‘body’ the back-up site. Over the last two weeks, the flight dynamics and operations teams at ESA have been making a detailed analysis of flight trajectories and timings for Rosetta to deliver Philae to one of these two sites at the earliest possible opportunity. Mosaic of 4 images acquired 24 September by Rosetta’s navigation camera 28.5 km from the nucleus (resolution approx. 2.5 m/pixel). 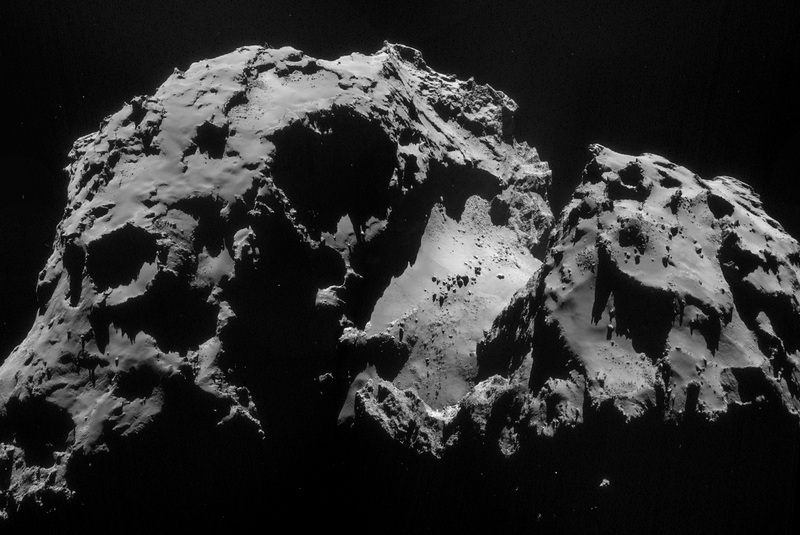 Credits: ESA/Rosetta/NavCam. If Site J is confirmed as the primary location, Philae will separate from the Rosetta orbiter at 8.35 UTC (9.35 CET) at a distance of 22.5 km from the comet’s nucleus and land some 7 hours later. Given the time taken for the signal from Rosetta to reach Earth (28 minutes and 20 seconds), confirmation of the landing will come at around 16.00 UTC (17.00 CET). If ESA decides to switch to the back-up Site C, separation will occur at 13.04 UTC (14.04 CET) at a distance of 12.5 km from the nucleus and touchdown will take place approximately 4 hours later. Confirmation of the landing would then be received by ESA at around 17.30 UTC (18.30 CET). ESA will announce final confirmation of the landing site and scenario on 14 October. On this occasion, ESA and CNES will be launching a public competition to name the landing site. CNES will also be broadcasting highlights of the landing with the Cité des Sciences et de l’Industrie in Paris, the Musée de l’Air et de l’Espace at Le Bourget and the Cité de l’Espace in Toulouse. Image acquired 21 September by Rosetta’s navigation camera. The back-up site C is just left of centre. Credits: ESA/Rosetta/NavCam. On 26 September at 0.00 UTC, Rosetta was 455 million km from Earth and the time taken to receive data from the spacecraft was 1,517 seconds, i.e. 25 minutes 17 seconds. All onboard systems and instruments were functioning nominally.